The Company shall avoid causing or contributing to a negative impact on human rights in its own operations and address any such impact if it arises. Employees should be able to combine working life and their free time. Kommuninvest shall have good knowledge of, and compliance with, applicable legislation and labour market agreements. This involves, in particular, discrimination legislation, environmental legislation, legislation regarding public companies and legislation relating to business relations. No form of discrimination is tolerated within the Company. Kommuninvest’s Gender Equality and Diversity Policy emphasises the importance of gender equality and diversity in the organisation, to ensure that the Company is an attractive employer for both current and potential employees. At the end of 2018, 45 (38) percent of the total number of employees were women. Of the managers, 36 (38) percent were women and, in the Executive Management Team, the proportion was 43 (43) percent. The ambition is to be able to attract, retain and develop skilled employees, regardless of gender, ethnic background, faith, age, disability, sexual orientation or transgender identity. Towards the end of 2018, 12 (18) percent of the Company’s employees came from countries other than Sweden. A total of 10 (13) different countries are represented in the organisation. The result of this year’s employee survey shows that Kommuninvest is an equal and non-discriminatory workplace, where employees feel considerable commitment to Kommuninvest’s social mission. Employees also perceive Kommuninvest as a workplace where you can combine work and leisure. Areas for improvement include the pace of work and stress, as well as internal communications. The 2018 Employee Satisfaction Index amounted to 73 (68) and the Employee Loyalty Index to 79 (75) – combined, the Company had 86 (81) percent satisfied and loyal employees, which is considered a relatively high value. Increasing absenteeism due to work-related stress and other psychosocial factors have caused Kommuninvest to initiate ambitious efforts within the framework of what we call “sustainable daily life”. Sustainable daily life offers everything from substantial opportunities for a good physical and social working environment, training and daily exercise, health-inspired lectures, stress management, individual coaching and self-help programmes. Among other things, all employees are offered individual health and lifestyle reviews on a regular basis. Based on these, employees are given tools to establish a sustainable lifestyle in the areas where the need is perceived to be greatest. This can involve everything from sleep, diet, exercise and lifestyle to work-related concerns. Kommuninvest does not work with sponsorship in traditional terms, but seeks cooperation partners who have a pronounced social commitment, with an emphasis on ventures in Örebro, where the Company has its head office. We focus on activities involving education, culture and social inclusion and share our values in terms of gender equality, diversity and ethics. Initiatives include helping immigrant upper-secondary pupils with their homework, support for artistic endeavours within OpenArt, opportunities for football and horse riding for people with disabilities, as well as initiatives for young immigrant women in the district of Vivalla. In 2018, an extensive initiative in leadership, collaboration, communication and culture was initiated. The employee programme has been developed to increase Kommuninvest’s capacity to develop in a time pervaded by ever-increasing complexity and rapid change. With the programme, Kommuninvest seeks, among other things, to establish platforms for developmental dialogue between employees and managers, to increase the quality of the communicative leadership and to give employees opportunities for personal development and better conditions for self-leadership. For various reasons, the transition into the labour market may take a particularly long time for some academics. Accordingly, each year, Kommuninvest gives a number of people the opportunity to gain relevant work experience that could ease the next step in their careers. At the end of 2018, eight people had undergone the threshold-passing programme and six of them had gained continued trust from other employers, generally in the form of permanent jobs matching their educational profiles. 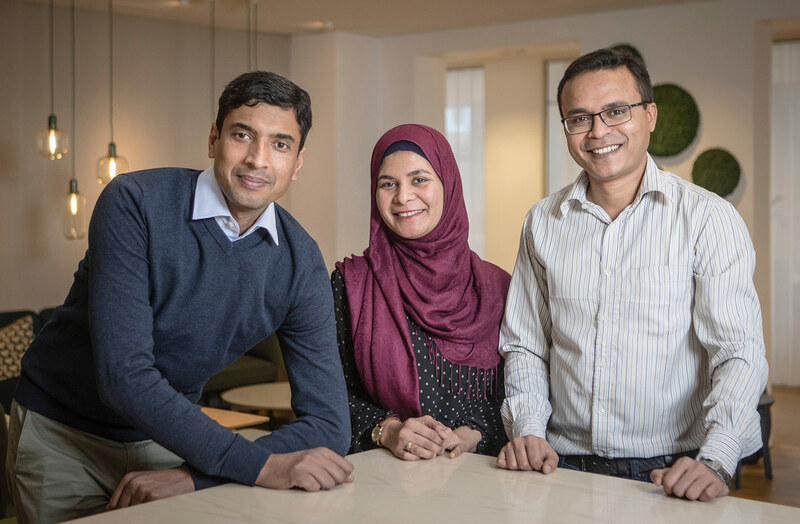 The three people pictured – Muhammad Amin Sadiq, Zubdah Farrukh and Mohammad Ehtasham Billah – began their threshold-passing jobs at Kommuninvest in January 2019. 1) Number of employees refers to the total headcount, including full and part-time employees, those on parental leave and temporary employees. The total number of permanent and probationary employees was 92 at the end of 2018.